First Methodist Church existed in the Manitoba community of Brandon from 1881 to 1925.The congregation was originally known as Grand Valley and then Brandon Methodist. The First Methodist service in the Brandon area was held August 29, 1881, conducted by Rev. Thomas Lawson, who became the first minister. The first church building was a Union Church, and consisted of a frame, one story building on the west side of 6th Street between Princess and Rosser Avenue. A Methodist Church was later built on 7th Street between Lorne and Louise Avenue and used until a new church, built on the Northeast corner of 8th Street and Lorne Avenue, was dedicated on November 5th, 1899. In 1925, First Methodist Church officially joined the United Church of Canada and became First United Church, which existed in Brandon from 1925 to 1969. A new memorial chapel was dedicated on September 21, 1952. – St. Paul’s United Churches to become Central United Church. The Carillon Bells originally donated to the Church by Mrs. Arma Sifton were given to the International Peace Gardens, and the church property was sold. The building was demolished in 1971. Kemnay United Church existed in the community of Kemnay, in the Rural Municipality of Whitehead, from 1925 to 1969. The church was built in 1892 and used by the Presbyterians, Methodists, and Anglicans. It became a Union Church in 1919. Kemnay United Church closed on July 6, 1969. The building was eventually sold and taken down, and today a memorial rock and a bronze plaque mark the former site of the church. Little Souris existed in the community of Little Souris, in the Rural Municipality of Cornwallis, from 1925 to 1968. Its predecessor was a Local Union Church that was originally a Methodist Church. In 1925, when it officially joined the United Church of Canada, it was part of the Beresford Pastoral Charge and had 58 communicants on the Roll. Little Souris United Church continued to be part of the Beresford Pastoral Charge until 1956, when it joined the Carroll Pastoral Charge. The church closed June 30, 1968 with the Rev. A Keating officiating. Most of the congregation transferred to Central United Church in Brandon. St. Andrew’s Presbyterian Church, built in 1899, became a mission church for St. Paul’s congregation. In 1925, St. Paul’s Presbyterian officially joined the United Church of Canada and became St. Paul’s United Church. Its predecessor was St. Paul’s Presbyterian Church, which continued to be used as a United Church. 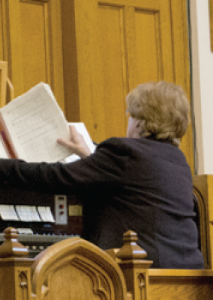 The church underwent some major restoration work in 1953, during which time a Casavant Freres 3 Manual organ, the largest of its kind in Western Canada at the time, was installed in the sanctuary, as well as a pulpit lectern built from salvaged wood. A Service of Re-dedication was held after the restoration work was completed on May 29, 1955. St. Paul’s and First United worked together to help establish the new congregation of Trinity United Church. On July 1, 1969, St. Paul’s United amalgamated with the Pentecostal Church and Kemnay and First United Churches to become Central United Church. Its predecessors were First, Kemnay and St. Paul’s United Churches and the Pentecostal Church. The four churches amalgamated on July 1st of that year, making it the largest United Church in Manitoba. The design of the new church reflected the historical layout of past churches and incorporated the few elements of St. Pauls that survived the fire, such as foundation stones that are now seats adjacent to the entrance courtyard on 8th Street, as well as the original limestone arches that now form the entrance to our new church. If you are interested in more history and information about Central United Church, please enquire about our history book.